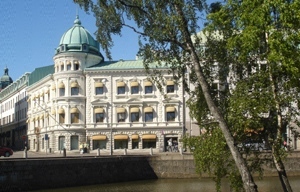 The Consulate-General of the People's Republic of China in Gothenburg was established in 1997 as China's only Consulate-General in Nordic region. The consular jurisdiction covers 7 counties of southern-west Sweden, including Värmland, Jönköping, Kronoberg, Blekinge, Skåne, Halland and Västra Götabland. The Consulate-General's principal businesses are promoting good-will exchanges and developing friendly cooperation between southern-west Sweden and China in all fields, handling passport and visa, notarization and authentication and safeguarding the legitimate rights of the Chinese nationals. Public Transportation: Tram 2. 6. 11, or Bus 16. 19. 25. 158 at Grönsakstorget. If you still have questions about visa to China after reading all the information carefully on this website, please contact the Visa Service Center, by telephone 031-7305866,(09:00-15:00 Mon-Fri). For questions about Chinese passport, authentication and legalisation, please contact the Consular Section Telephone: 031-842445 (09:00-11:30 and 14:00-15:00,Mon-Fri). For other questions, the general office can be reached by telephone 031-842340.